What?! How is it Labor Day weekend? Wasn’t Memorial Day like yesterday????? I love summer. So many fun things go hand in hand with this time of year. Cookouts, camping, hiking, beaches, pools, lakes–it goes on and on. I’m always so sad when it’s over. More and more lines of canned wines have hit the scene in the last few years with the expressed purpose of better serving these kind of low-key good times. The lightweight, portable, recyclable packaging is perfect for these situations. Another clear benefit is that cans don’t shatter, so it’s perfect for scenarios where bare toes might be out. I do sometimes still encounter resistance to cans from people who are skeptical that a good wine can come in a can. However, I feel like I see new canned wine options out every day, which suggests to me that they are gaining ground. Anecdotally, last summer we held a “Can Can” party at Bay Grape showcasing some favorite canned options and it turned out to be a big hit. Quite a few guests entered as skeptics and left as converts. In general, I’m a fan. These wines tend to be light, fruity, fun, and refreshing. It’s really all about context. Are these wines you’re going to sit and sip contemplatively over the course of an evening? No, of course not. But is that even what you want when you’re chilling by the pool or hanging out with friends at a BBQ? A can of something chilled and refreshing suits the scenario much better. Moreover, more and more quality options are entering this space. 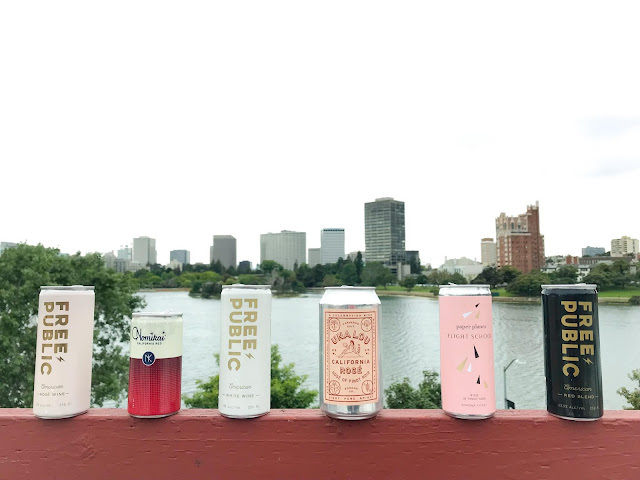 I think that rosé wines are particularly well suited to the canned format, and rosé as well goes hand in hand with summer scenarios in general–win win. White wines in cans also make perfect sense. I’ve liked the reds I’ve tried less, but there are some decent options which particularly work if you’re having a sunny day cookout with meaty things on the grill. When the situation allows, I do generally recommend pouring these wine into another cup to get the most flavor out of the wines. It might seems to defeat the purpose a bit, but it's kinda hard to smell much out of a can's tiny opening. "Where shall I take you to?" asks the Una Lou can. Our answer: Yosemite Valley. $11 for a 375 ml can–same as a ½ bottle. Purchased at Bay Grape. You can also buy a 4-pack for $40 directly from the Una Lou's website. The Una Lou’s Rosé of Pinot Noir is one of my favorites. 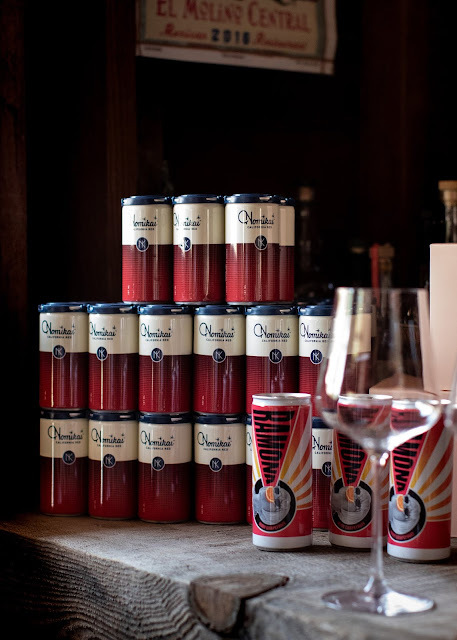 It happens to come from oh-so-trendy Scribe Winery, but this cool-kid wine delivers. Andrew Mariani and his wife, Lia Ices, created this wine in honor of their daughter’s birth. To keep the good karma coming, a percentage of proceeds will go to the Edible Schoolyard and The Center for Land-Based Learning. The grapes are organically farmed in Sonoma. Greg and I enjoyed this one as a happy hour treat after a hike in Yosemite Valley along with an assortment of trail snacks. I’d kept the cans nicely chilled in a cooler bag and it suited the scenario well as the can serves two glasses perfectly. Tossware provided me with samples of their recyclable plastic glassware, which I brought along for the ride and they were perfect for the picnicking scenario. They describe the wine as having wild strawberry, grapefruit and sea salt. I’d add dusty cherries and a light hint of stony mineraltiy. The wine is bright and fresh, but also shows a little bit of structure. Prices run from about $6 for 250 ml can for a single can to low twenties for a 4-pack. 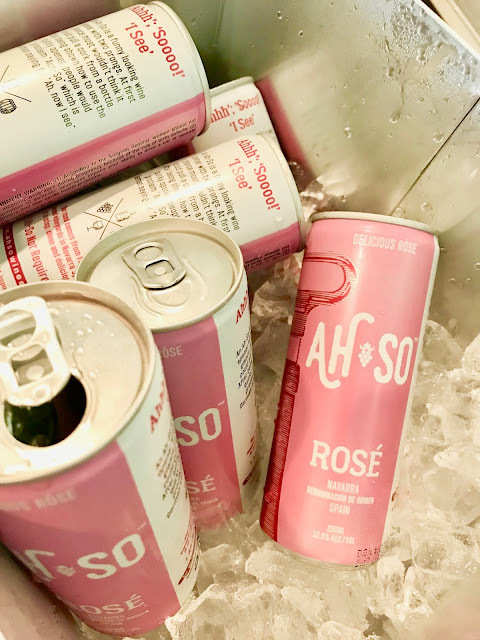 I tried the Ah-So Rosé at the Global Garnacha Summit a few months ago. It was a day of panels and tastings all focused around Grenache. What was funny was that the most heated conversation of the entire day centered around this little wine and the pro and cons of cans. I thought this was just delicious. It was super bright and floral, with notes of raspberries, a little tangerine skin, and strawberries on the nose. On the palate, the bright sweet-tart strawberries continued, along with watermelon, a little bit of peach, and pink flowers. It was tart and fresh. Yum! The grapes for this wine come from gnarled old vines in the López de Lacalle family’s Artazu estate in Navarra near the Pyrenees mountains The wine is sourced from high-altitude, organically farmed vineyards, and it’s made from 100% free run juice vinified in stainless steel tanks. $7 for a 250 ml can–about 1.5 glasses. Purchased at Bay Grape. $28 for a 4-pack on the Paper Planes website. 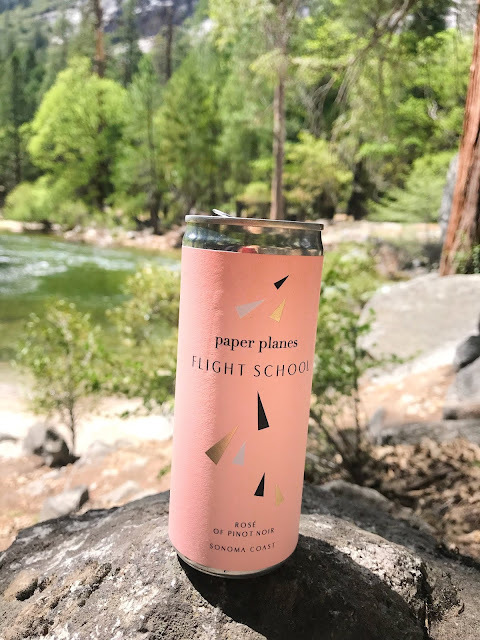 Paper Planes is all about the rosé. Literally. They focus solely on the pink juice. Laura and Kyle Gabriel left careers in film and music in Los Angeles to launch Paper Planes. They crowdsourced funding for the project, launched their first vintage in 2014, and quit their jobs to go all-in on the project 2015. 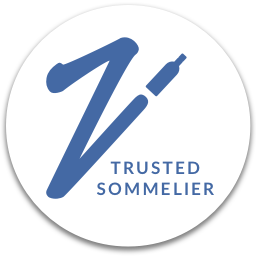 They make their wines from Pinot Noir sourced from the Russian River Valley. 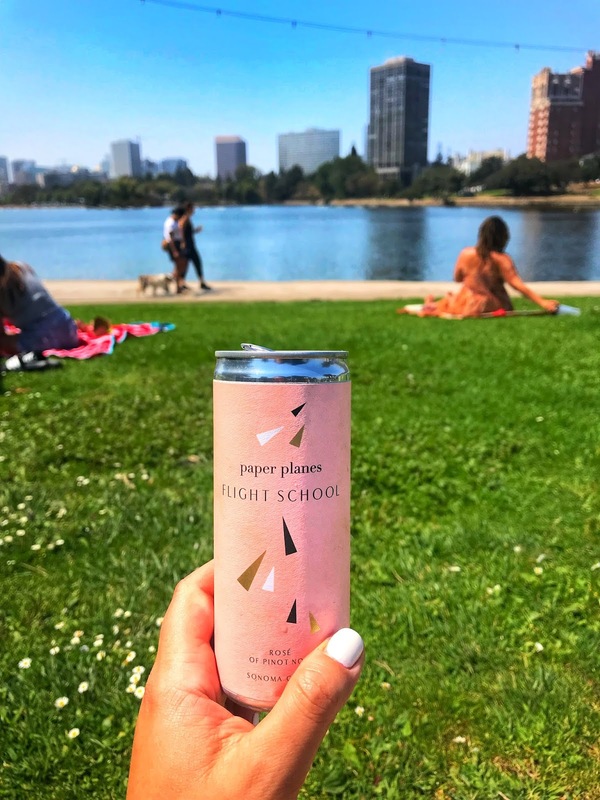 Their lightly effervescent canned Flight School version is made with equal care. Greg and I took this and the next wine along with us on a hike in Yosemite along with lots of snacks. Admittedly, we did these two wines a bit of a disservice because we did not keep them cold while we hiked. They were cool, but not chilled and both would have been better colder. This one had notes of candied strawberry, cherry, and watermelon. I liked this one better than Greg did. He found it a little too fruity at the slightly warmer temps, but I thought it was light and fun. We tried this one again on a picnic and this time served it colder, as it should be, and both really enjoyed it a lot this time around. Under the proper temperature all the flavors remained but the strawberry note was brighter and less candied. It was super light and breezy. 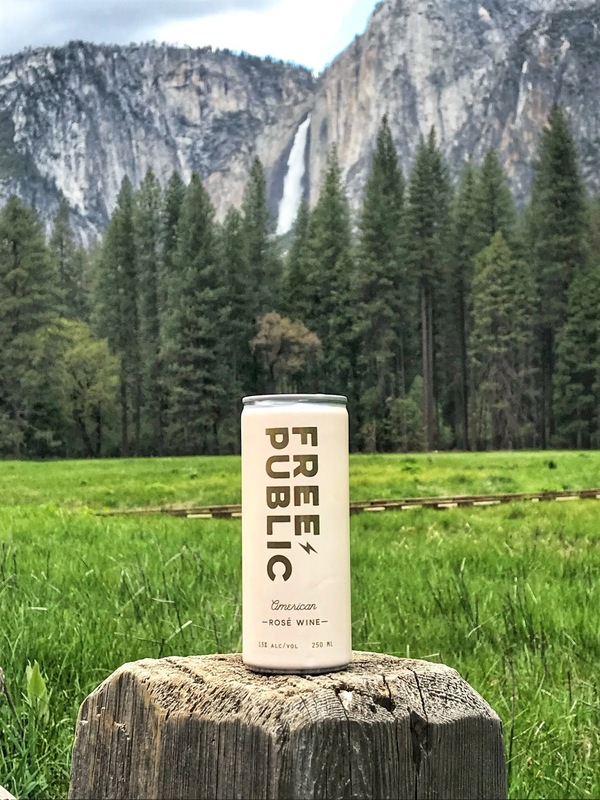 Free Public makes a Rosé, White, and a Red with the idea to “encourage and support wildness in humans and nature by keeping public spaces free to roam.” They’re a designated Social Purpose Corporation (SPC) to give back to the land. 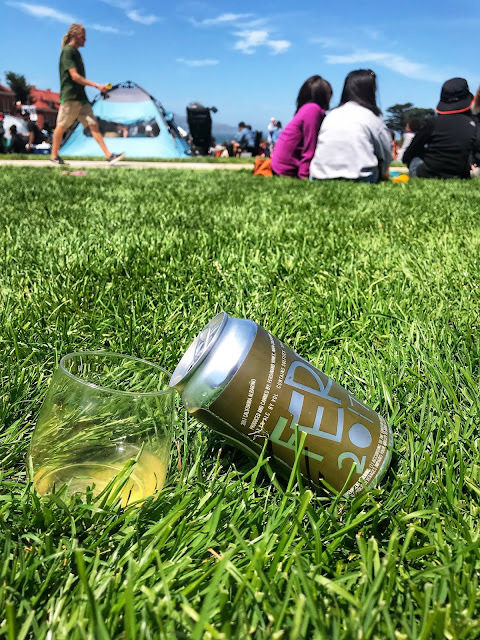 They feel that cans fit right in with the mission as the ecological impact of cans is offset by their recyclability and the significant lower shipping weight when compared to bottles. Plus, since they’re lighter, they’re easier to pack out. The team behind the wines includes the people behind Underwood Wines, Stumptown Coffee, and Penner-Ash Cellars. The grapes are sourced from a variety of vineyards up and down the west coast. They’re intended to be off-dry (but not cloying), fruity, and served chilled. The rosé is a blend of 80% Syrah and 20% Pinot Gris showed notes of cherry, raspberry, and little stone fruit, a squeeze of citrus, and white flowers. We brought the rosé along with us on the same hike we took the Paper Planes Flight School above, and Greg preferred this one a bit. I enjoyed the white one night while Greg was away on a business trip. It was the perfect size for one. It’s a round and fruity 50/50 blend of Riesling and Chardonnay which showed lots of bright citrus, notes of tinned pineapples, and crispy apples. There was a touch of residual sugar here, just enough to keep it tangy, and made it a good match for Szechuan leftovers. This would also be great for chill’n by a pool. Free Public’s was one of two reds we tried in this slate. Made of 90% Pinot Noir with a 10% Syrah, it was the deeper of the two we tried–albeit it’s still light enough to take a chill. It had a mix of juicy blackberries and black cherries. This would be a good option for a cookout, since the fruitiness and the hint of RS would complement the sweetness of BBQ sauce or ketchup. Average price per can: $5. After a long day of hiking, Greg and I enjoyed this Nomikai Red and the Free Public above while kicking back at our hotel one evening. The Nomikai is a blend of Merlot, Mourvedre and other red varieties. It had spiced red berries, it had a light dustiness, but was still fruity. It was a little lighter on the palette than the Free Public. Co-creator Connor Drexler describes the inception of this line: “Nomikai was born three years ago in the desert when I wanted a good rosé to pair with watching the sunset with friends. 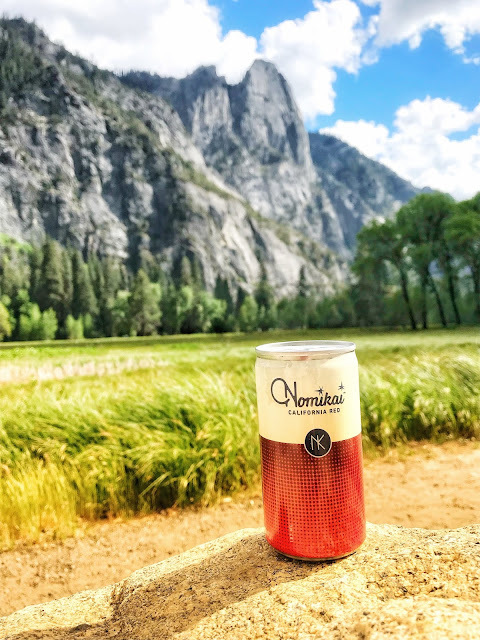 We created Nomikai as a portable rose that winemakers, Megan and Ryan Glaab, and I would be proud to have with our friends.” They created the red soon after. As with the Free People wines above, sustainability is a core goal of this line. They note that even the handles are made from post-consumer recycled material and are 100% recyclable. The line is named for a type of Japanese drinking party that center around workplace celebrations that commemorate milestones and help co-workers build bonds. It’s fitting then that we had Nomikai wines at Bâtonnage, while so many industry bonds were in the works. $36 for a 4-pack 375 ml cans on their website. 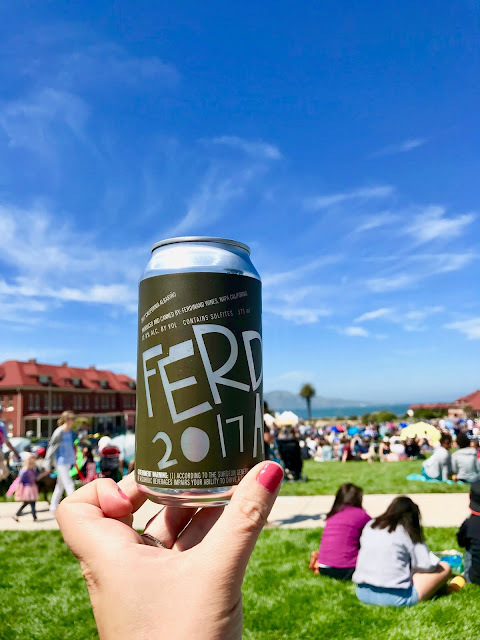 I brought a can of Ferdinand Albariño with me on a picnic in the Presidio and it was perfect on a sunny day with notes of white peaches and a mix of citrus fruits. There’s a bit of round texture to the mouthfeel, but it finishes crisp and refreshing with a hint of salty minerality. A solid tasty, easy drinker. Evan Frazier is the man behind Ferdinand Wines. He makes his wines at Kongsgaard, where he is also the General Manager and Assistant Winemaker. In addition to the Albariño, he also makes a Tempranillo. The wines are both single vineyard wines in disguise. They’re labeled with California as the appellation to allow for future flexibility. 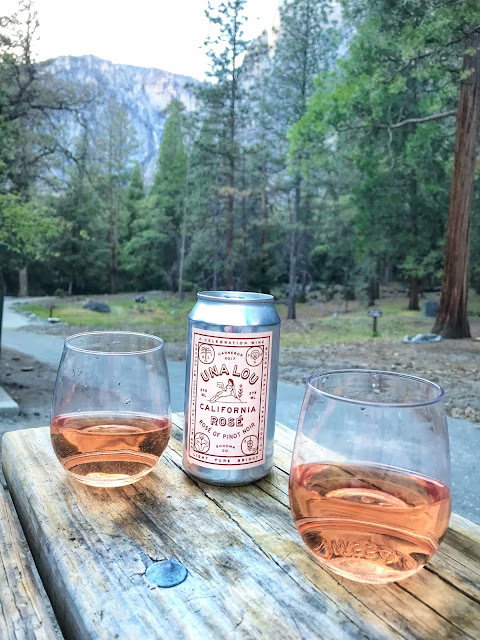 Soon after our trip to Yosemite, I met up my gal pals for book club and Angel, our host for the day, had purchased a bunch of cans of rosé to taste test. I had not told her I’d been taste testing cans beforehand. I somehow promptly lost the notes I took that afternoon, but one I clearly remember liking was the Mirabeau Pure Provence Rosé. 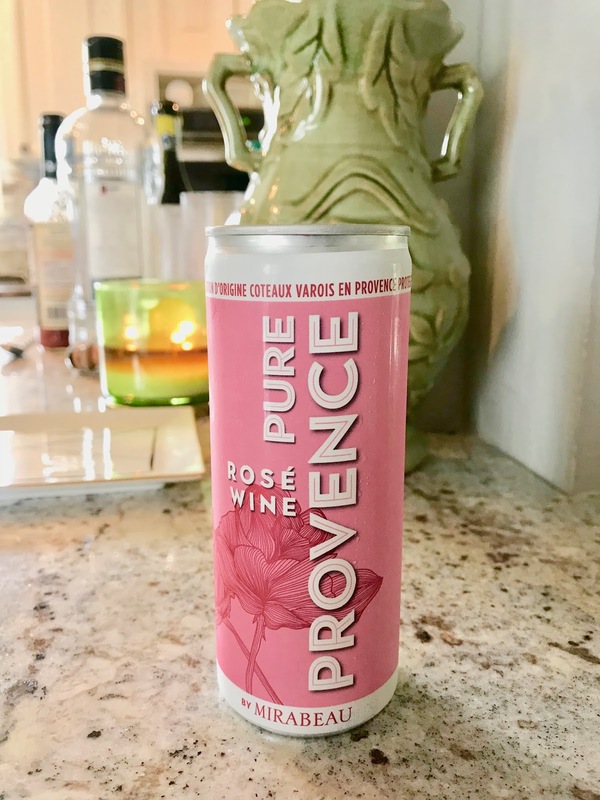 Made in a more delicate style in line with Provence's take on rosé, it was light and crisp with hints of floral notes over cherries and white peaches. 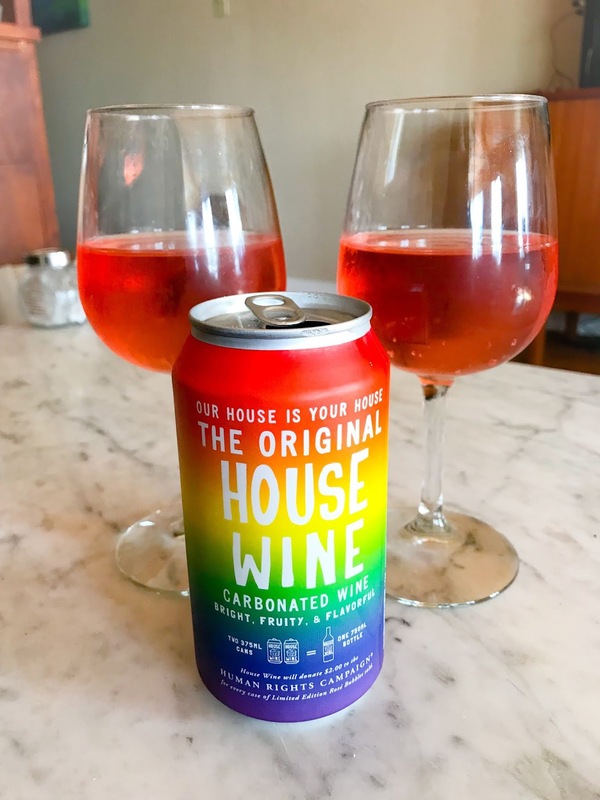 The House Wines Rosé was fruity with bright strawberries and refreshing with a little carbonation. Our only complaint was that we wanted even more fizz. Greg and I drank this one for a little SF Pride Weekend Celebration. And whattaya know, Oakland Pride is next weekend, so it might be time for round two. 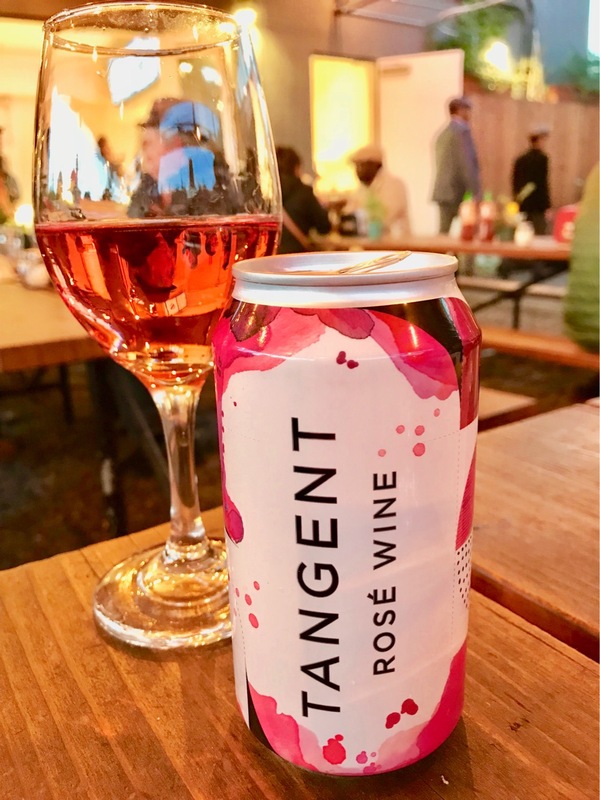 This Tangent Rosé was light and blousy with subtle flavors of cherries, raspberries, and flowers. I enjoyed it while hanging out with a friend eating pizza and wings. The cans keep on coming. More and more keep rolling out. I’ve had quite a few others I’ve liked, but we’ll have to leave those for another post. This one already kept getting away from me, threatening to be bury me under a proverbial avalanche of cans. The bottom line is that cans are definitely worth considering for summer fun. They're not going to blow your mind with their layers of complexity, but that's also not at all what they're meant for. These are all about easy drinking. And there's no need for wine snobbery when you're playing outside.